This tour, before the show starts, Mr. Dylan gives the audience a bit of film to watch. Internet search gives all messages with almost the same text, only revealing that it's a 20 minute fragment from Intolerance (1916) by Mr. Griffith. As Intolerance clocks at 177 minutes* it's only part of the movie, but much is unclear. Is it always the same fragment or are successive parts projected so loyal fans can see the whole movie? If the same part is repeated, what part is not specified, making it difficult to discover a special meaning for this inclusion. Did Mr. Dylan decide for a pre-show movie and did he say: yes, that must be from Intolerance? Or did he order the men just to come up with something, and they did, and it was fine? We don't know. And indeed, Mr. Dylan got the 1997 Gish Prize, and Dorothy and Lilian Gish were famous Griffith actresses. But if there is a link it must be more obvious. Mr. Griffith worked behind the screen. 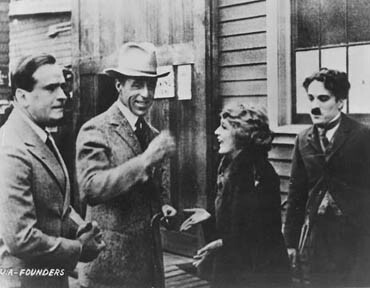 When forming United Artists with his friends Mary Pickford, Douglas Fairbanks and Charlie Chaplin in 1919 he was to the public the less known of the four. Did Mr. Dylan perhaps think that Mr. Griffith needed a profile boost, like his recent figuring in the Katie Melua song "Mary Pickford"? 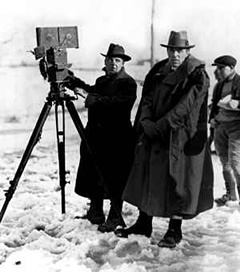 David Wark Griffith (1875-1948) was a pioneer filmmaker who almost single handed changed and developed the language of film. He brought elements as framing, cutting and story telling for the first time together to create a coherent basic screen grammar. That way he freed the cinema from the shackles of it's theater background. He also left movie capital New York to settle in California and used the environment as location. Mr. Griffith worked close together with his long time cameraman Billy Bitzer, who sure earns also credit for his work. They made hundreds of short movies, first one reelers, then longer, and then longer again, until they ended at what we now know as feature length. Their true companion was the legendary Pathé Professionnelle. A lover of literature and poetry, Mr. Griffith based the structure of his stories partly on the narration technique of Charles Dickens, with cut backs and parallel lines. He also adapted Poe, Tennyson and Browning for the screen, using poetry as means of storytelling and changing movies that way from ordinary chasing and suspense to art. After Many Years (1908), after Tennyson, was the first American film without a chase, but with a dramatic close-up and cut back. Enoch Arden (1911), based on the same poem, was the first two-reeler shown in one part. Browning's Pippa Passes (1909) was the first film with a four-part pattern, while the biblical Judith Of Bethulia (1914) had a same structure now in four reels. Other well known films from this period are The Lonedale Operator (1911), A Corner In Wheat (1909), The Musketeers Of Pig Alley (1912) and The Unchanging Sea (1910) after Charles Kingsley's The Three Fishers. After films like the Poe based The Avenging Conscience (1914), the first American six-reeler, Mr. Griffith concentrated on his great master piece The Birth Of A Nation (1915), but this 12-reel epic drama met not only with success but also with heavy critique because his view on black Americans as it was based on The Clansman by Thomas F. Dixon Jr. His answer was his other great master piece, Intolerance (1916). In 14-reels he revisited the four-part pattern, using all his skills. The episodes are tied together with a line of his favorite poet Walt Whitman: "Out of the cradle, endlessly rocking". Important among the later films of Mr. Griffith are beauties like Hearts Of The World (1918), Broken Blossoms (1919), Way Down East (1920) and Orphans Of The Storm (1921). But the times they were changing and with the growth of Hollywood, the refinement of the studio system, there was no place anymore for romantic individuals who had helped so much to create the language of the cinema. He made his last film in 1931 and died almost forgotten after many years of lonely retirement. Why shows Mr. Dylan part of a movie by Mr. Griffith? It's hard to say. Was there ever discussion about the music played in advance of the show? The only thing that mattered was The Copland Tune, as the starting sign for the show. And now that movie. Is there a real meaning or is it only for our amusement? Take for example Mr. Dylan's Lily, Rosemary And The Jack Of Hearts, not because of the name, but for the atmosphere. It's easy to imagine the ladies as Mr. Griffith's classic heroins, while some of the lines are like close-ups and others like establishing shots. There is editing in the scenes, flash back, different point of view. But is that a link or just some far-fetched guessing? Let's just say Mr. Griffith and Mr. Dylan have perhaps more in common than only a hat. - Iris Barry (with Eileen Bowser), D. W. Griffith: American Film Master. * There are versions of Intolerance with different duration. That has nothing to do with one being more complete than the other, but with projection speed. In general silent pictures are filmed and projected with 16 frames/second, the limit to avoid flickering of the image. When taking more care of photography they used sometimes 18 frames/second to have a more steady image. One feet of original 35MM film counts 16 frames, so all versions of Intolerance are around 11820 feet, split as 14 reels.